Check Point needs to reassure investors that it isn't losing business to rivals. 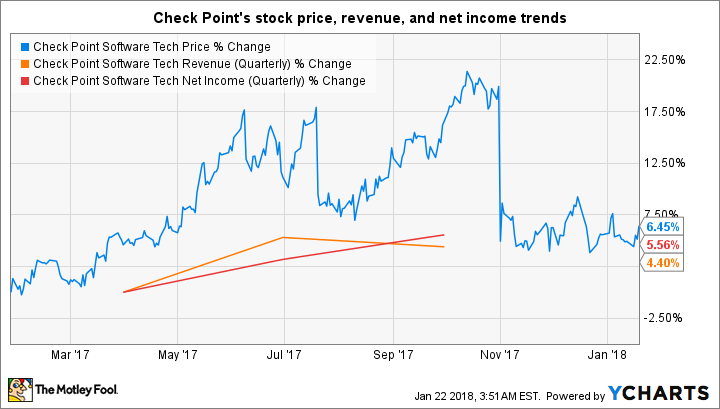 Check Point Software Technology (NASDAQ:CHKP) shares haven't recovered from the beating they took after the Halloween afternoon release of the company's third-quarter results. Investors were extremely disappointed with the cybersecurity specialist's guidance that turned out to be far below Wall Street's expectations. Check Point told investors to expect $505 million in fourth-quarter revenue at the midpoint of its guidance, which would be 3.7% year-over-year growth. Analysts had been modeling for $529.2 million in sales. So, is Check Point losing ground in the cybersecurity space to rivals, or will it be able to spring a positive surprise when it releases its fourth-quarter results on Jan. 31? Check Point has lost its top-line momentum over the past year, and its earnings aren't growing at a terrific pace, either. This seems to have dented investor confidence in the stock as the cybersecurity market itself is growing at a faster pace. Gartner estimates that cybersecurity spending shot up 7% in 2017 to $86.4 billion. And 2018 could turn out to be even better for the cybersecurity industry with sales expected to hit $93 billion. So Check Point is growing at a slower pace than the broader market it operates in, and has told investors to expected a muted result for Q4. The company was in better shape a year ago when fourth-quarter sales increased 6% year over year. Investors might especially take note as Check Point rivals like Cisco and Palo Alto Networks are growing at much faster rates. 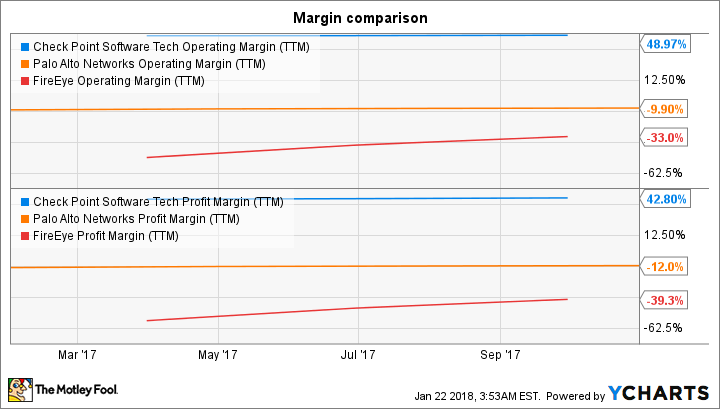 Palo Alto, for instance, reported 27% year-over-year revenue growth last quarter, while Cisco's security business increased 8% during the quarter that ended in October. So, there is a good chance that Check Point is being crushed by its rivals, and it needs to get back on track. Check Point has adopted a conservative approach, spending just 23% of its revenue on sales and marketing last quarter as compared to Palo Alto's 51% outlay. Cisco, on the other hand, is capable of bundling its security services into the networking hardware equipment and software products that it sells, so it doesn't have to hunt separately for cybersecurity customers. It would be prudent for Check Point to ramp up spending on sales and marketing. The good news is that it can do so if it wants to. Check Point's has a strong balance sheet with $1.5 billion in cash and no debt. Additionally, it has far superior margins when compared to pure-play cybersecurity specialists Palo Alto and FireEye. Check Point can use its cash and afford to take a hit to its margins to push its products more aggressively to potential customers. The number of $1 million-plus deals that Check Point signed during the third quarter fell to 60 from 65 in the prior-year period. The drop occurred despite the launch of the company's new Infinity cybersecurity architecture in April last year. Infinity is an integrated cyber-defense platform that secures multiple environments such as data centers, mobile, and the cloud, and it is equipped with an intelligent threat prevention system. Ideally, a new security platform should have helped Check Point attract more customers, but this hasn't been the case. So, the company needs to advertise aggressively. Check Point could be left behind if it focuses too much on bottom-line growth instead of selling its services. Investors will be looking for assurance in the upcoming quarterly report that revenue growth will be accelerating.